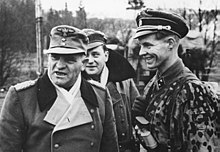 Josef Dietrich (28 May 1892 – 21 April 1966) (also known as "Sepp") was a German politician and SS commander during the Nazi era. He joined the Nazi Party in 1928 and was elected to the Reichstag of the Weimar Republic in 1930. Prior to 1929, Dietrich was Adolf Hitler's chauffeur and bodyguard. He received rapid promotions in the SS after his participation in the extrajudicial executions of political opponents during the 1934 purge known as the Night of the Long Knives. Despite having no formal staff officer training, Dietrich was, along with Paul Hausser, the highest-ranking officer in the Waffen-SS, the paramilitary branch of the SS. Reaching the rank of Oberst-Gruppenführer, he commanded units up to army level during World War II. As commanding officer of the 6th Panzer Army during the Battle of the Bulge, Dietrich bore responsibility for the Malmedy massacre, the murder of U.S. prisoners of war in December 1944. After the war, Dietrich was convicted of war crimes at the Malmedy massacre trial, conducted by the U.S. military tribunal, and later in West Germany for his involvement in the 1934 purge. Upon his release from the U.S. prison, he became active in HIAG, a lobby group established by former high-ranking Waffen-SS personnel. Dietrich died in 1966. Josef "Sepp" Dietrich was born on 28 May 1892 in Hawangen, near Memmingen in the Kingdom of Bavaria, German Empire. In 1911 he joined the Bavarian Army with the 4. Bayerische Feldartillerie-Regiment "König" (4th Bavarian Field Artillery Regiment) in Augsburg. In the First World War he served with the Bavarian Field artillery, He was promoted to Gefreiter in 1917 and awarded the Iron Cross 2nd class. In 1918 he was promoted to Unteroffizier (sergeant). Last Bavarian army record lists Dietrich as recipient of Iron Cross 1st class. After the Great War Dietrich worked at several jobs, including policeman and customs officer. He joined the Nazi Party (NSDAP) in 1928, got a job at Eher Verlag, the NSDAP publisher, and became commander of Hitler's Schutzstaffel (SS) bodyguard. His NSDAP number was 89,015 and his SS number was 1,117. Dietrich had been introduced to Nazism by Christian Weber, who was his employer at the Tankstelle-Blau-Bock filling station in Munich. He accompanied Hitler on his tours around Germany. Later Hitler arranged other jobs, including various SS posts, and let him live in the Reich Chancellery. On 5 January 1930 Dietrich was elected to the Reichstag as a delegate for Lower Bavaria. By 1931 he had become SS-Gruppenführer. When the Nazi Party seized power in 1933, he rose swiftly through the hierarchy. He became the commander of the Leibstandarte SS Adolf Hitler (LSSAH) and member of the Prussian state council. 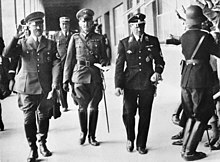 As one of Hitler's intimates, Dietrich was often able to disregard his SS superior, Heinrich Himmler, at one time even banning Himmler from the Leibstandarte barracks. The LSSAH eventually grew into an elite division of the Waffen-SS. Although the unit was nominally under Himmler, Dietrich was the real commander and handled day-to-day administration. In the summer of 1934 Dietrich played a key role in the Night of the Long Knives. Hitler, along with Dietrich and a unit from the Leibstandarte, traveled to Bad Wiessee to personally oversee Ernst Röhm's arrest on 30 June. Later at around 17:00 hours, Dietrich received orders from Hitler for the Leibstandarte to form an "execution squad" and go to Stadelheim prison where certain Sturmabteilung (SA) leaders were being held. There in the prison courtyard, the Leibstandarte firing squad shot five SA generals and an SA colonel. Additional SA personnel identified by the regime as traitors were shot in Berlin by a unit of the Leibstandarte after Hitler told him to take six men and go to the Ministry of Justice to shoot certain SA leaders. Shortly thereafter, Dietrich was promoted to SS-Obergruppenführer. 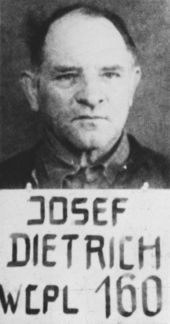 Dietrich's role later earned him a 19-month sentence from a postwar court. After World War II began, Dietrich led the Leibstandarte during the German advance into Poland and later the Netherlands. After the Dutch surrender, the Leibstandarte moved south to France on 24 May 1940. They took up a position 15 miles southwest of Dunkirk along the line of the Aa Canal, facing the Allied defensive line near Watten. That night the OKW ordered the advance to halt, with the British Expeditionary Force trapped. The Leibstandarte paused for the night. However, on the following day, in defiance of Hitler's orders, Dietrich ordered his III Battalion to cross the canal and take the heights beyond, where British artillery observers were putting the regiment at risk. They assaulted the heights and drove the observers off. Instead of being censured for his act of defiance, Dietrich was awarded the Knight's Cross of the Iron Cross.. During this campaign elements of the Leibstandarte were responsible for the killing of Allied captives, the Wormhoudt massacre. 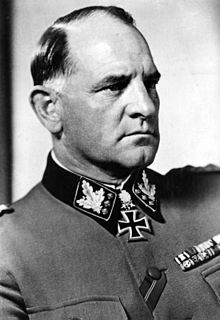 Dietrich remained in command of the Leibstandarte throughout the campaigns in Greece and Yugoslavia before being promoted to command of the 1st SS Panzer Corps, attached to Army Group Center, on the Eastern Front. In 1943, he was sent to Italy to recover Benito Mussolini's mistress Clara Petacci. He received numerous German military medals. Dietrich commanded the 1st SS Panzer Corps in the Battle of Normandy. He rose to command 5th Panzer Army during the later stages of this campaign. Hitler gave him command of the newly created 6th Panzer Army. Dietrich led it in the Battle of the Bulge (December 1944-January 1945). He had been assigned to that task because, due to the 20 July Plot, Hitler distrusted Wehrmacht officers. On 17 December, Kampfgruppe Peiper—an SS unit under his overall command—murdered 84 U.S. prisoners of war near Malmedy, Belgium, in what is known as the Malmedy massacre. In March 1945 Dietrich's 6th Panzer Army and the LSSAH spearheaded Operation Spring Awakening, an offensive in Hungary near Lake Balaton aimed at securing the last oil reserves still available to Germany. Despite early gains, the offensive was too ambitious in scope and failed. After that failure, the 6th SS Panzer Army (and LSSAH) retreated to the Vienna area. As a mark of disgrace, the Waffen-SS units involved in the battle were ordered by Hitler to remove their treasured cuff titles. Dietrich did not relay the order to his troops. Shortly thereafter, Dietrich's troops were forced to retreat from Vienna by Soviet Army forces. Dietrich, accompanied by his wife, surrendered on 9 May 1945 to the U.S. 36th Infantry Division in Austria. Dietrich had the complete confidence of the Führer because of his plain-speaking loyalty; the old political fighter was one of Hitler's favorites. He therefore enjoyed much lavish publicity, numerous decorations and a rapid series of promotions. Dietrich often took gambles, much to the dislike of the OKW, such as when he sent the Leibstandarte division "charging into Rostov" without orders "purely to gain a prestige victory". Once Dietrich was promoted to a Corps command he was at least assisted by competent staff officers transferred from the army; still, the army command had to take some pains to keep him in line. By 1944 there were clear signs that he had been elevated above his military competence. He reportedly had never been taught how to read a military map. Field Marshal Gerd von Rundstedt considered him to be "decent but stupid" and was especially critical of Dietrich's handling of the 6th Panzer Army in the Ardennes. Even Dietrich's principal staff officer conceded that he was "no strategic genius". Dietrich was tried as Defendant No. 11 by the U.S. Military Tribunal at Dachau ("United States of America vs. Valentin Bersin et al. ", Case No. 6-24), from 16 May 1946 until 16 July 1946. On that day he was sentenced to life imprisonment in the Malmedy massacre trial for his involvement in ordering the execution of U.S. prisoners of war. Due to testimony in his defence by other German officers, his sentence was shortened to 25 years. He was imprisoned at the Landsberg Prison in Bavaria. Dietrich served only ten years and was released on parole on 22 October 1955. He was re-arrested in Ludwigsburg in August 1956. He was charged by the Landgericht München I and tried from 6 to 14 May 1957 for his role in the killing of SA leaders during the Night of the Long Knives in 1934. He was sentenced to 19 months for his part in that purge and returned to the U.S. military prison at Landsberg. He was released due to a heart condition and circulation problems in his legs on 2 February 1958. By then he had already served almost his entire 19-month sentence. Upon his release from prison he took an active part in the activities of HIAG, an organization and lobby group of former Waffen-SS members. Founded by former high-ranking Waffen-SS personnel, it campaigned for the legal, economic and historical rehabilitation of the Waffen-SS, with limited success. In 1966 Dietrich died of a heart attack. Six thousand people, including many former SS men, attended his funeral. Dietrich was married twice: he was divorced from his first wife in 1937 and remarried in 1942. He had three children. Before his second marriage he was a visitor of the Salon Kitty. ^ "Sepp Dietrich railed against the Führer and [the Führer's] entourage to such an extent that it became most unpleasant. Then, he was sent for, and he said: 'All right, that's fine but I shall speak my mind. I shall tell Adi' -he always calls Hitler 'Adi'- 'that he is leading us all to destruction'." Spoken by General der Panzertruppe Heinrich Eberbach while in captivity in Britain and secretly taped by the MI-19 Directorate of the British Military Intelligence. ^ a b c d e f g h i j k l m n Snyder 1994, p. 66. ^ a b c d e f g h Zentner & Bedurftig 1997, p. 197. ^ a b c Ailsby 1997, p. 33. ^ Cachay, Bahlke & Mehl 2000, p. 350. ^ Messenger 2005, p. 39. ^ Flaherty 2004, p. 154. ^ a b Stein 1984, p. 238. ^ Stein 1984, p. 239. ^ a b MacKenzie 1997, pp. 155-156. ^ Neitzel 2007, p. 266. ^ Caddick-Adams 2014, p. 753. ^ Parker 2014, p. 216. ^ Hyde 1985, p. 372. Biondi, Robert (2000). SS Officers list : (as of 30 January 1942) : SS-Standartenfuhrer to SS-Oberstgruppenfuhrer : Assignments and Decorations of the Senior SS Officer Corps. Schiffer Publishing. ISBN 978-0-7643-1061-4. Caddick-Adams, Peter (2014). Snow and Steel: The Battle of the Bulge, 1944–45. New York: Oxford University Press. ISBN 978-0-19-933514-5. Cook, Stan; Bender, Roger James (1994). Leibstandarte SS Adolf Hitler: Uniforms, Organization, & History. San Jose, CA: R. James Bender. ISBN 978-0-912138-55-8. Hyde, Montgomery (1985). Crimes and Punishment. Marshall Cavendish. ISBN 978-0863073724. Large, David C. (1987). "Reckoning without the Past: The HIAG of the Waffen-SS and the Politics of Rehabilitation in the Bonn Republic, 1950–1961". The Journal of Modern History. University of Chicago Press. 59 (1): 79–113. doi:10.1086/243161. JSTOR 1880378. MacKenzie, S.P. (1997). Revolutionary Armies in the Modern Era: A Revisionist Approach. New York: Routledge. ISBN 9780415096904. Messenger, Charles (2005). Hitler's Gladiator: The Life and Wars of Panzer Army Commander Sepp Dietrich. London. ISBN 978-1-84486-022-7. Messenger, Charles (1988). Hitler's Gladiator: The Life and Times of Oberstgruppenfuhrer and Panzergeneral-Oberst Der Waffen-SS Sepp Dietrich, London. ASIN: B000OFQ62W. Neitzel, Sönke (2007). Tapping Hitler's Generals: Transcripts of Secret Conversations, 1942–45. Frontline Books. ISBN 978-1-84415-705-1. Parker, Danny S. (2014). Hitler's Warrior: The Life and Wars of SS Colonel Jochen Peiper. Boston: Da Capo Press. ISBN 978-0-306-82154-7. Archived from the original on 2017-06-29. Cachay, Klaus; Bahlke, Steffen; Mehl, Helmut (2000). Echte Sportler – gute Soldaten. Die Sportsozialisation des Nationalsozialismus im Spiegel von Feldpostbriefen (in German). Weinheim, München Germany: Beltz Juventa. ISBN 978-3-7799-1130-2. Höhne, Heinz. Der Orden unter dem Totenkopf, Verlag Der Spiegel, Hamburg 1966; English translation by Richard Barry entitled The Order of the Death's Head, The Story of Hitler's SS, London: Pan Books (1969). ISBN 0-330-02963-0. Meyer, Georg (1987). "Auswirkungen des 20. Juli 1944 auf das innere Gefüge der Wehrmacht bis Kriegsend und auf das soldatische Selbstverständnis im Vorfeld des westdeutschen Verteidigungsbeitrages bis 1950/51" [Effects of 20 July 1944 on the internal structure of the Armed Forces to end the war and the soldier's self-understanding in advance of the West German defense contribution to 1950/51]. Aufstand des Gewissens. Der militärische Widerstand gegen Hitler und das NS-Regime 1933–45 [Revolt of conscience. The military resistance against Hitler and the Nazi regime from 1933 to 1945] (in German) (3rd ed.). Herford, Germany: E.S. Mittler. ISBN 978-3-8132-0197-0. Thomas, Franz; Wegmann, Günter (1998). Die Ritterkreuzträger der Deutschen Wehrmacht 1939–1945 Teil III: Infanterie Band 4: C–Dow [The Knight's Cross Bearers of the German Wehrmacht 1939–1945 Part III: Infantry Volume 4: C–Dow] (in German). Osnabrück, Germany: Biblio-Verlag. ISBN 978-3-7648-2534-8.